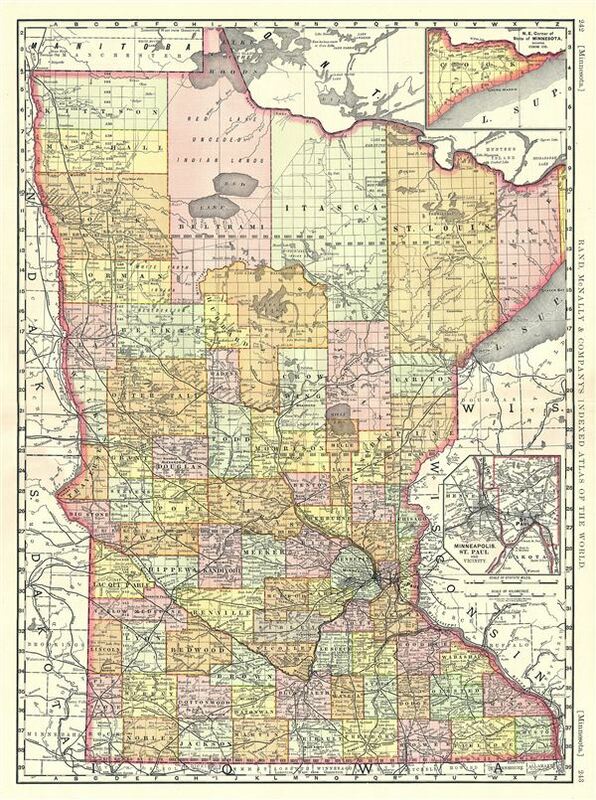 This is an appealing 1889 example of Rand McNally and Company's map of Minnesota. The map covers the entire state, with the north east corner of the state features in an inset in the upper right quadrant. Another inset of Minneapolis, St. Paul and vicinity is included in the bottom right quadrant. The map also delineates survey grids and plats referencing the work of the U.S. Land Survey. The area near Red Lake is identified as 'Red Lake Unceded Indian Lands.' Color coded according to counties, the map also identifies major towns, cities, rivers, and other topographical features. This map was issued as plate nos. 242 and 243 in the 1893 edition of Rand McNally and Company's Indexed Atlas of the World- possibly the finest atlas Rand McNally ever issued. Rumsey 3565.123 (1897 edition). Philips (atlases) 1026 (1898 edition).